My shower routine involves a mixture of products every few weeks, and I don't really wait for a set to finish before I switch around. 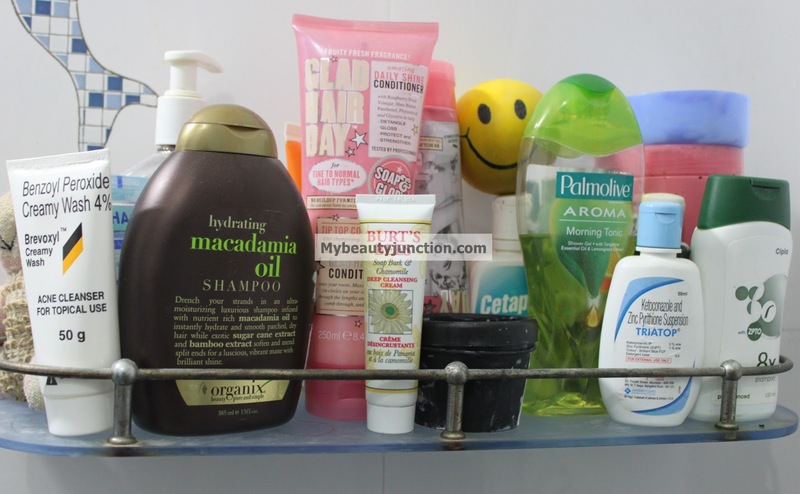 I was tagged by Tshering of TiTi's Corner for this post, so you can see my bath and body products-of-the-moment for yourselves! Now for the products. I'm using Soap & Glory Flake Away and Palmolive Aroma Morning Tonic right now. 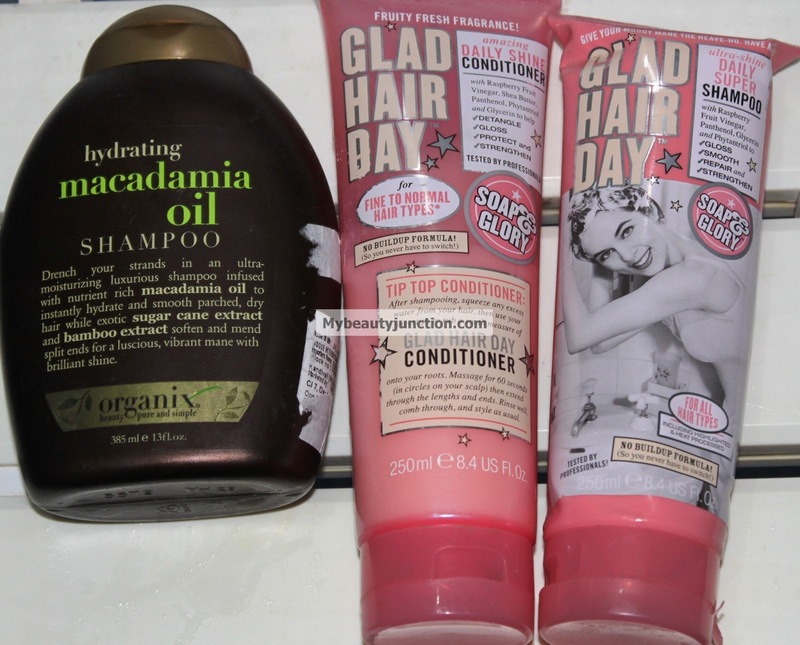 For hair, it's Organix Macadamia Oil Hydrating Shampoo and Soap & Glory Glad Hair Day shampoo and conditioner. 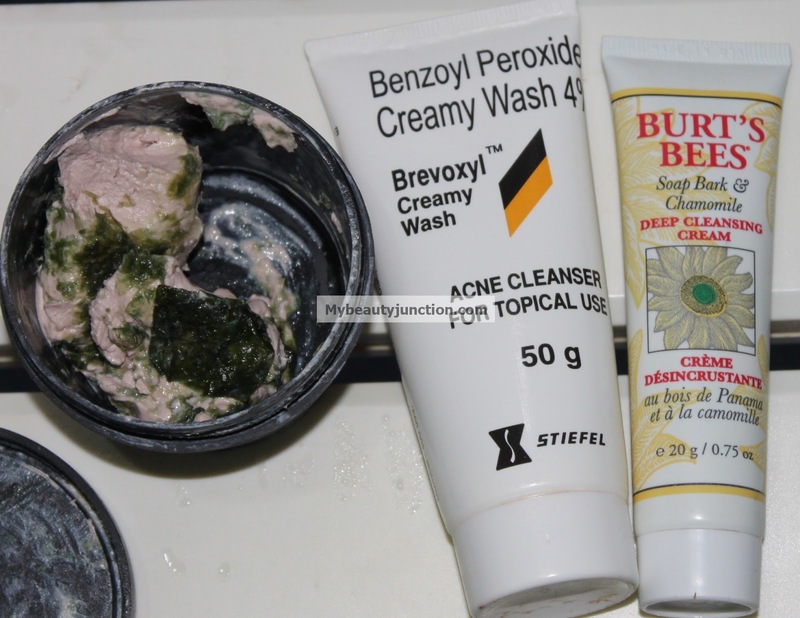 For my face, I use Brevoxyl Creamy Wash in the morning and Burt's Bees Deep Cleansing Cream at night. The Lush Aqua Marina has been upstaged by Burt's Bees, though I'll definitely finish it! And I'm going to do a detailed review of the Burt's Bees cream soon. I'm also a Venus person and can't bear anything else. 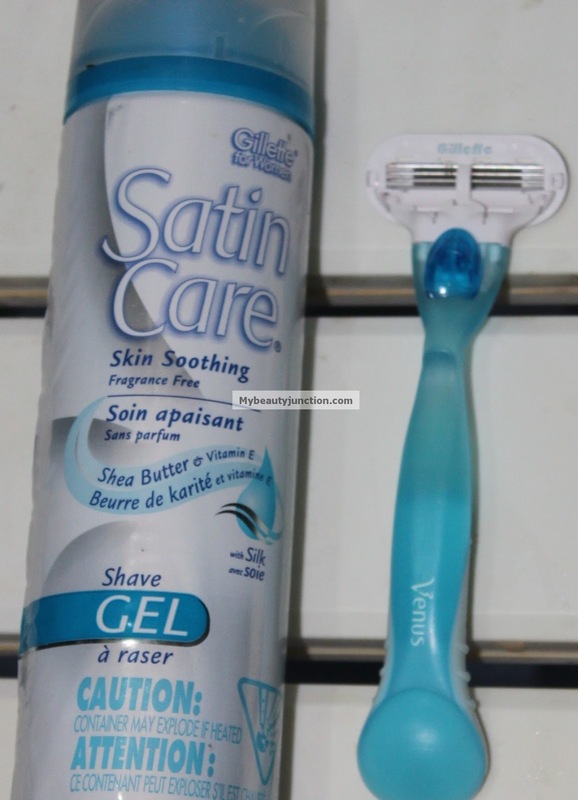 And Satin Care has to be the plainest possible, so as not to irritate my skin. 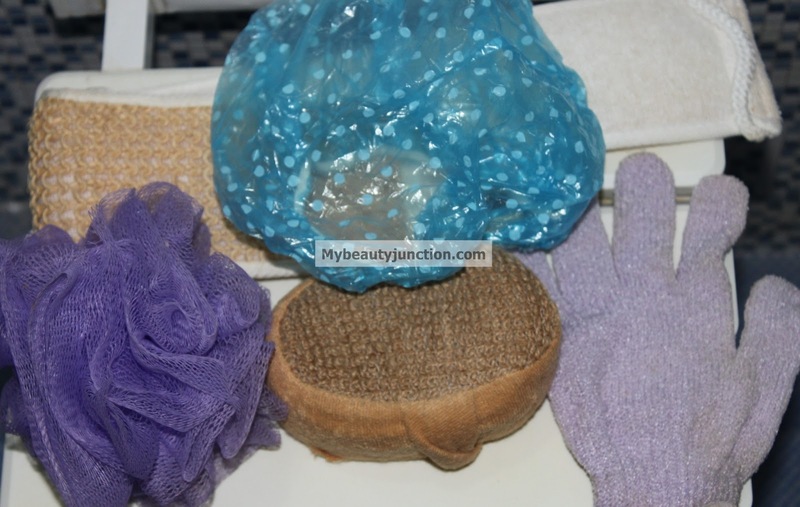 I love loofahs, bath lilies and The Body Shop gloves - and my blue shower cap. 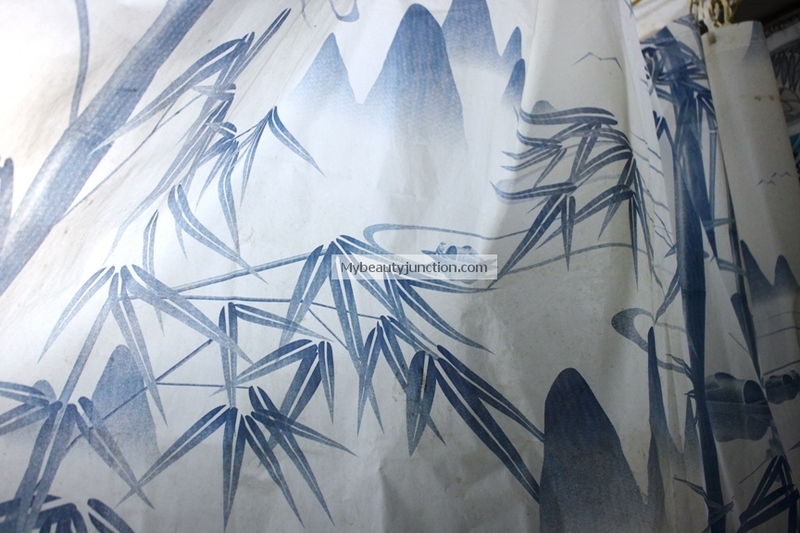 Unfortunately, my whales-themed shower curtain has gone for an overdue cleaning, so I've got my bamboo-mountain-and-Chinese-fishing-themed curtain at the moment. And the three bear-like fluffy creatures on the fish-hook were made by my cousin when we were in school and I've kept them ever since. The cupcake freshener is from Accessorize. The pine lily leaf freshener is on the door to hide the glue from stickers that peeled off. 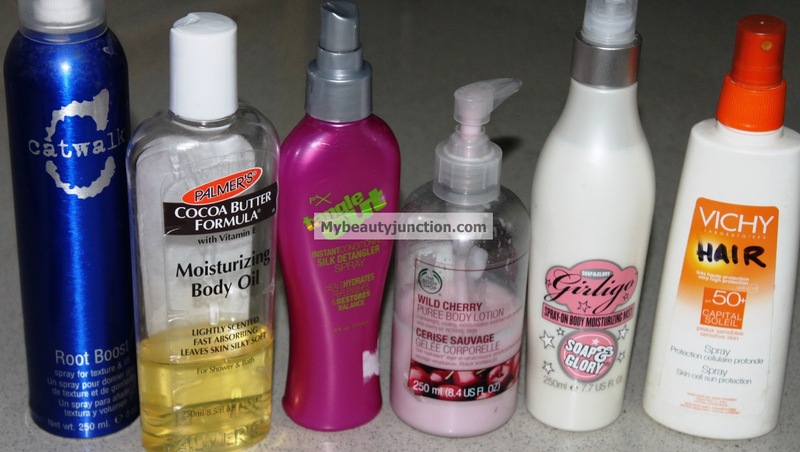 I use Palmer's Moisturising Body Oil immediately after a bath, and The Body Shop Wild Cherry Moisturising Lotion or Soap & Glory Girligo in the mornings, though I admit I tend to skive off sometimes. Just after I finish shampooing (and conditioning) I use FX Tangle Out and a DIY hair spray, which I store in a bottle of used-up sunscreen. This is my favourite conditioning spray ever and I'll share the recipe soon. I use Catwalk Root Boost just after a shower sometimes - only if I'm going to blow dry. So that is the summary of my bath-and-body routine. I've forgotten to photograph a few things including bubble bath, salts, foot files, foot scrub and whatnot. This has been a fun tag to do, and I would be really interested in reading about the products you use in your daily routine. Do share the link if you decide to do this tag!